CHOCOLATE, of course, is the classic Valentine’s Day consumable. The Aztecs were probably the first to make the connection between amorous feelings and the cocoa bean. The emperor Montezuma was said to have fueled his romantic trysts by ingesting large amounts of the bean. CINNAMON is a delightful, fragrant, and stimulating spice. The Romans believed cinnamon was an aphrodisiac. Cleopatra famously used it to arouse her many lovers. COFFEE AND TEA contain caffeine, which is considered a perk in the department of stimulating amorous desires. When coffee was first introduced to the Turkish culture, husbands were expected to keep their wives well supplied. If the husband could not provide daily coffee for his wife, it was a legitimate cause for her to divorce him. Fair enough since a wife's ability to make coffee was one of the ways a husband decided whether she was a good match for marriage. I came up with this idea when I finished baking a batch of chocolate chip cookies and had about ½ cup of extra chips. I saw the cinnamon sticks on my shelf and decided to chocolate-coat them, just a fast, fun way to use the extra chips. That evening, I served the chocolate-covered cinnamon sticks with our after-dinner coffee, receiving happy compliments and quite a few kisses from my Valentine. I hope you all receive the same! Start with selecting your favorite chocolate. What kind of chocolate? Because no sugar is added to this very basic recipe, I prefer using a chocolate that has sugar in it such as white, milk, semi-sweet, or Mexican. If you like dark chocolate, by all means use it. Just taste it first and make sure the flavor is good naked, without additional ingredients added. A bittersweet chocolate (one with a very high cocoa percentage) may be delicious in a cake, cookie or pudding, but remember that you're adding sugar to those recipes. To many people, dark (or baking) chocolate with little or no sugar added will taste too bitter for this recipe. entire top of the carton and forget about the bottom. B. Wax paper method – Place wax paper over a large, flat dish. The only drawback with this method is appearance. Your chocolate-covered cinnamon sticks will still taste delicious but there will be a funny sort of flat side to your stick. If you want prettier sticks, use my method A (the egg carton). NOTE: If you have no wax paper, do no use paper towels or a naked dish! The chocolate will adhere to these surfaces and your sticks will be ruined. Parchment paper and aluminum foil are better alternatives. The top stick was made with my egg carton method. The bottom was made using the wax paper method. the longer sticks are easier to work with. Step 2 – Melt Chocolate: Place ½ cup chocolate chips (or about 4 ounces of block chocolate, chopped) into a microwave safe bowl. I use my Pyrex measuring cup. WARNING: Chocolate burns easily, especially white and milk chocolates, which have more milk solids, so you really need to be careful when you melt chocoalte in a microwave. Nuke it for about 20 seconds. Remove the bowl and stir (make sure the spoon is dry because moisture will make the chocolate seize up). The chocolate won’t be completely melted yet, but you need to stir it to prevent burning. Now microwave it for another 10 seconds. Remove and stir again. Continue this process until the chocolate is completely melted. Step 3 – Dip sticks (gee, that sounds funny, doesn't it? ): Okay, one at a time, dip one end of each cinnamon stick into the melted chocolate. Allow excess chocolate to drip off the stick, back into the bowl. Spin the stick around slowly until the drips stop completely. Now place the clean end of the stick (the end you’re holding) into the prepared egg carton. Step 4 – Wait: The chocolate must dry and harden. Give it about an hour before touching. To speed up this process, carefully move the dish (on which you’ve placed either the egg carton or wax paper) into the refrigerator for about thirty minutes. To serve: Once the chocolate hardens, you're ready to use. Lightly stir the chocolate-covered stick into your cup of hot coffee (espresso, tea or cocoa). Stir only enough to re-warm the chocolate. Place the stick into your mouth like a lollipop and enjoy the taste on your lips and tongue. The flavors of warm chocolate and cinnamon combine with the coffee to create a lovely after-dinner sensation. It’s a deliciously fun and sensuous dessert experience with very few calories. A perfectly blissful ending to a romantic meal. To store: Once the chocolate is completely hardened, simply place sticks in a plastic baggie and store in your refrigerator. The perfect Valentine's Day treat! I like that it's guilt-free, too. 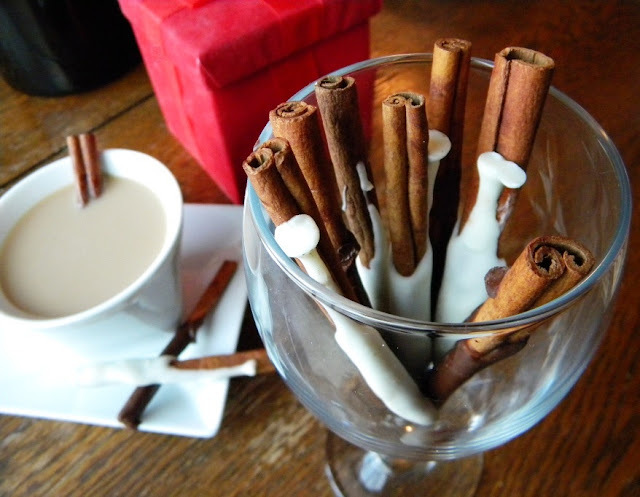 :) Nice tips for using longer cinnamon sticks...and I like the idea of the egg cartons. 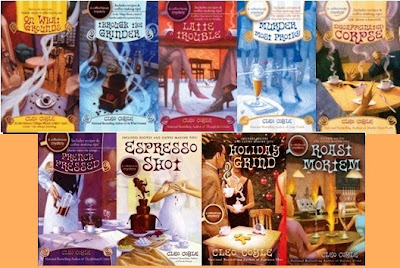 These look fantastic, Cleo! What fun! Love the egg carton idea. I never would have thought of that. And how I love chocolate. Catch my post on Thursday (heh-heh). Hmm... I think we may be having a theme week here, without even planning it. Chocolate will feature prominently on Friday, too. Can you tell we're all in a Valentine's Day mood? Great ideas, Cleo. Love the egg carton idea! Oh, my goodness!!! Love the idea and the tips. I will be making these for a party this weekend. 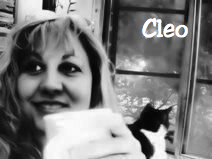 Thanks, Cleo! Oh Cleo, you romantic devil you. I'll jump on the chocolate bandwagon, i just made cookies. Picture this, instead of chocolate chips, i made them using chocolate/candy covered coffee beans... You would go nuts for them. Kind of got the idea from your brownie recipe way back when. 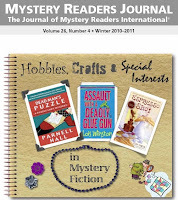 @Elizabeth - Thank you kindly for the nice words, and I have to mention that I am really enjoying the posts at your own blog Mystery Writing is Murder. Have a great day! @Avery - This was a fun recipe to do. And a little bird told me that your Thursday post will be full of chocoaltey goodness, too. Looking forward to it! @Julie - Oh, boy! We can never have enough chocolate recipes on this blog! Looking forward to your Friday Valentine post, as well. Cheers! @Harbingerdc - Wonderful! I hope your party guests enjoy them. So little chocolate, so much fun and flavor, perfect with coffee (and for anyone with an oral fixation), so much healthier than cigarettes, lol. @Dave - Those candy-covered coffee bean cookies sound like they're off the hook. Really. I'll be right over (okay, so charting a plane to KS might increase my carbon footprint a smidgen, but, hey, they're coffee-bean cookies)! Love the calendar idea. I'm sure my fellow crime-writing cooks would love this, as well -- no clue how to implement. Suggestions welcome! Whoa! What a winner! Fun and yummy and great for entertaining. Thanks Cleo for a very long but equally easy to follow recipe!! Awesome idea! I really love this, may have to selfishly make some just for myself! Fabulous idea!! Adds such flavour and pizazz to hot drinks! Very nicely done! Sometimes simple recipes are just to fun!!! Love this idea, and perfect combo, chocolate AND cinnamon, YUM!!! This is wonderful and so easy :). Thanks Cleo, hubby and I will have to celebrate on Sunday as he will be back out of town the 14th and my middle one, Logan has surgery on Valentine's day. I told him since he was missing his party at school I would be his Valentine :). What a GREAT idea!! I really enjoyed this! Wow , I would never think about something like that! Thanks for sharing! I love the smell of cinnamon. This is such a great idea! What an interesting idea! First time I see that! I love cinnamon in everything, so with chocolate , even better. I'm always putting cinnamon sticks in my coffee and chai tea. Thanks for the great idea!